TALLMAN.PROMO scarves can be worn as a show of affection towards your favourite hockey or soccer team, and keep you looking trendy about town. Or maybe you are looking for a clever way to promote your business. Why not purchase in bulk some scarves and give them out to your best customers? Or keep them for giveaways and sales days. 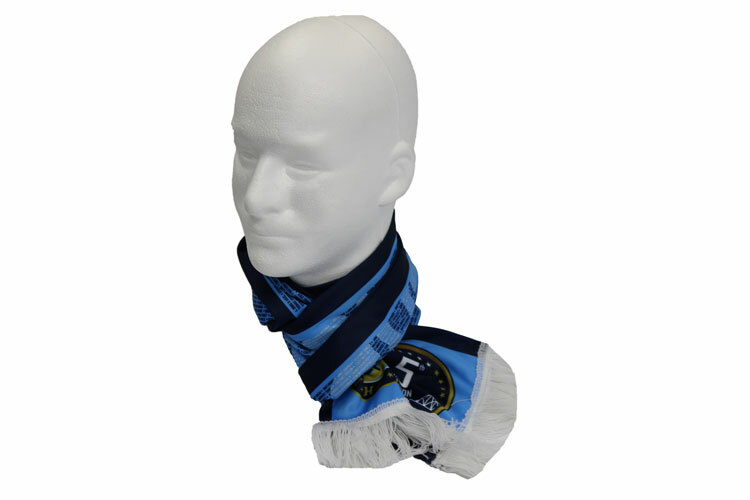 Scarves are a great way to work with your sponsors while engaging your audience. If you have your design ready send it to us or if you need some help bringing your idea to life, contact our talented team. The material, size, coverage and artwork is all up to you. Together we can create an epic scarf that will stand out. This product is printed using sublimation printing process. For more information, visit our Production Methods page. Scarves are made from elastic polyester. Options include 2 layers and 2 sided printing. For custom projects contact us.